Do you love seeing the big picture? 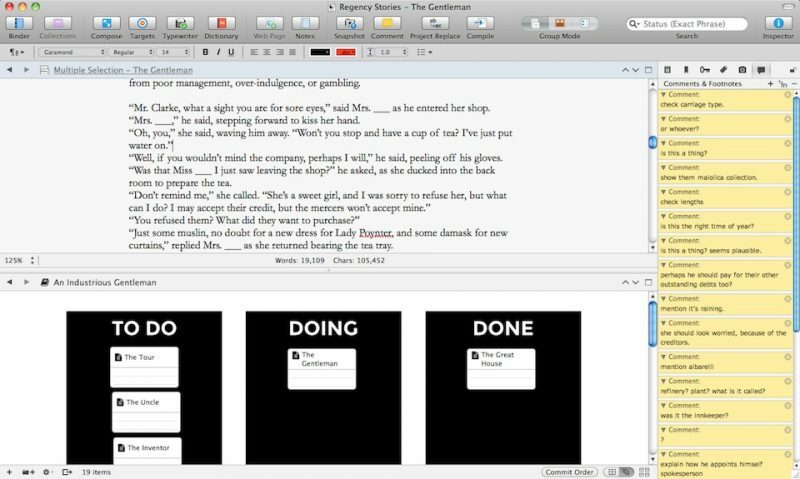 Do you love working in Scrivener? 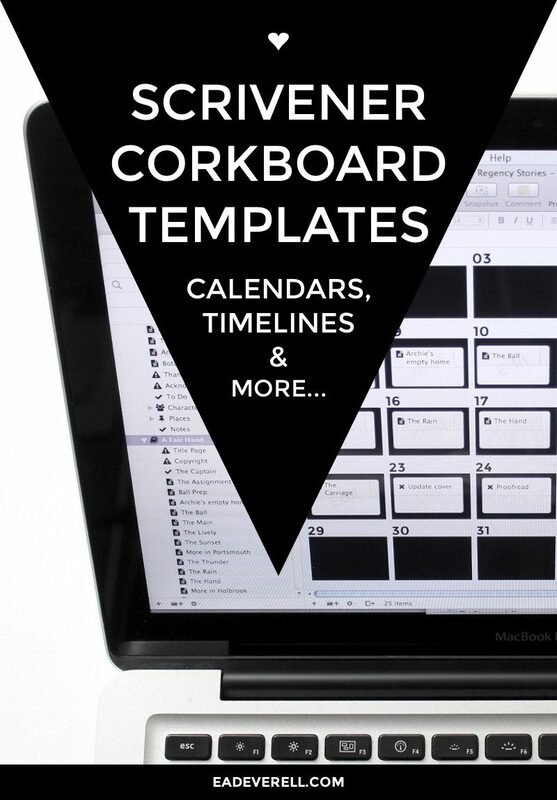 Then I think you’ll love these Corkboard templates I’ve created for you! Having searched high and low for a task management app that would integrate (or at least import and export) with Scrivener and give me a decent month-to-view calendar, I finally alighted on this simple solution. This background allows me to schedule scrivenings or folders to work on for each day. I can track what stage of completion each item is at by using the Status field stamps or icons. Because the backgrounds tile, moving an item to edge of the screen in either direction will give you another blank month to use! So neat. DON’T FORGET you can use these backgrounds to organise your own workflow OR you can use them to get an overview of your story timeline. I haven’t used the Kanban method much myself, but I can certainly see the appeal of ending the day with a looong “done” list! I think I would keep this pane open in split view while I edited, for extra motivation. I’m SO excited about this template! As you may or may not know, The One Page Novel is chiefly a visual plotting method. So far, when I’ve moved my plot points onto the computer, I’ve always had to change it from the “one page” view to a linear list view. With this background, you can have the best of both worlds, and quickly switch between this overview structure, the story order, and the matrix view of the Outliner which is particularly helpful for adding subplots (as seen in the spreadsheet template), all without moving a single document around! You can move a project file or folder down the stages like a board-game. The only problem with this would be if your workflow follows a different order, or if two stages overlap. For example, you might start designing/formatting as you plan, and begin promoting before publication. You can place the project folder at the top of the “ladder”, then use the stage spaces to keep track of notes, to-do lists, contact info, resources, etc. It’s never too early to start planning for NaNoWriMo. You don’t have to wait until November to use this template, of course. You can challenge yourself to write a 50,000-word novel any month you like! This infinite timeline can be useful for getting a quick overview of how many hours/days/years have passed between each scene. You can keep the freeform Corkboard open in split-screen view and move scenes into place as you write or edit. It’s often a bit of a pain to try to calculate your timeline when you come to edit, so this can be a quick and easy way to track and pace your story as you go. If you’re writing non-fiction, you can use this timeline to create a visual representation of your reader’s journey. 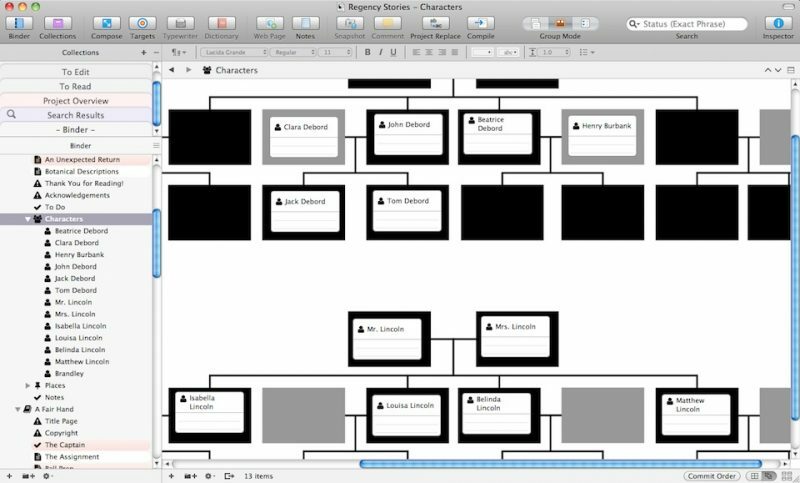 For more complex dynasties, Scapple might be a better option, but if you already have a folder full of character profiles in Scrivener, you can easily organise them into family trees using this Corkboard background. 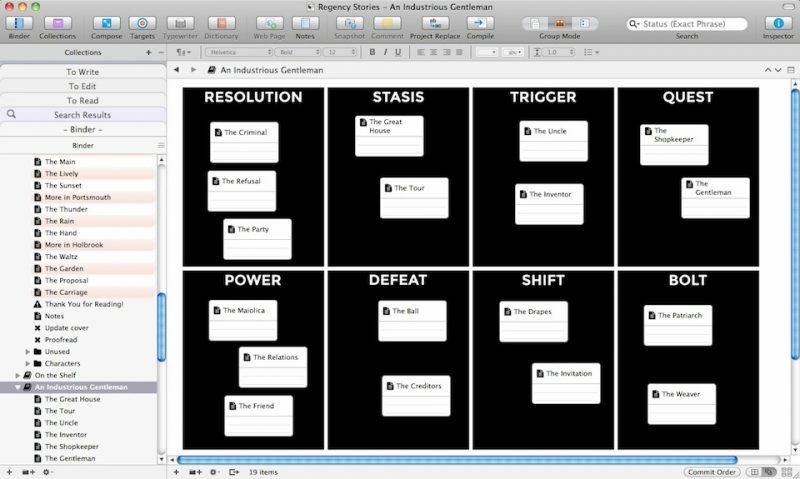 Scrivener allows you to create lots of independent Corkboards. 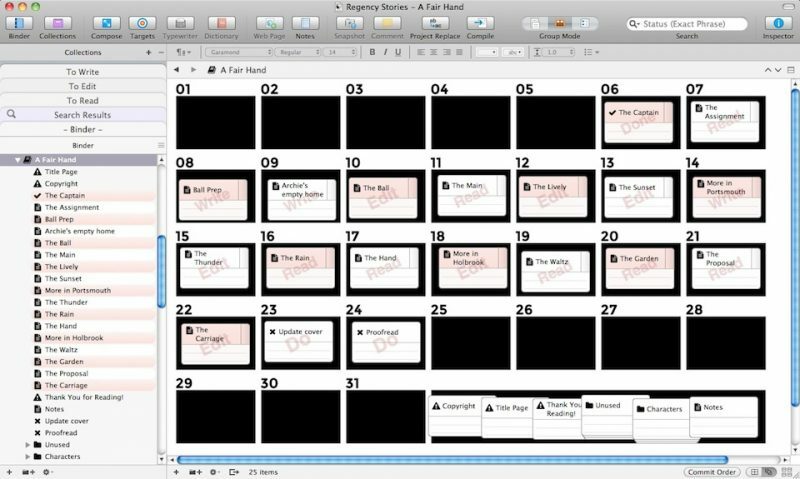 Not only can you organise story sections on a Corkboard, you can also schedule or manage entire projects. This is because every level of a Scrivener project can have its own Corkboard view. 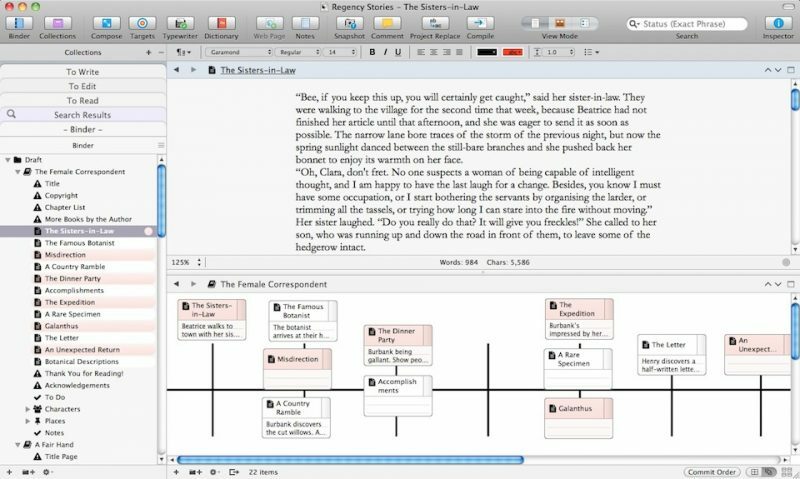 AND you can use Collection Corkboards to combine levels, so you can have index cards for folders and scrivenings in the same view. 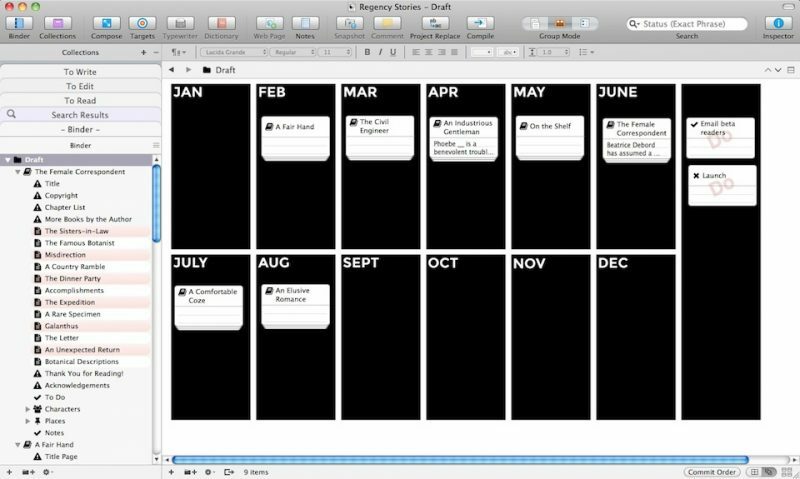 This means that you can create your entire publishing schedule/editorial calendar in Scrivener! You can create separate Collections for weekly, monthly and yearly project views simply by selecting the relevant files and then going to Documents > Add to Collection > New Collection. Then click the Collection title on the lower left-hand pane. Then View > Corkboard, and then View > Corkboard Options > Freeform. 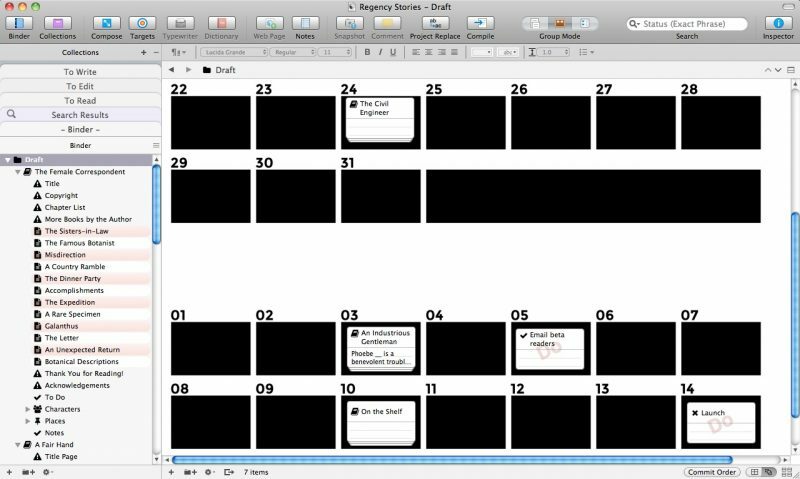 Then change your freeform Corkboard background to one of the calendar templates. The only limitation is that you can only set ONE freeform Corkboard background to be used across a project. So you either have to choose one background, or swap them out every time you want to view a Corkboard that you want to organise differently. The latter isn’t as awkward as it sounds. 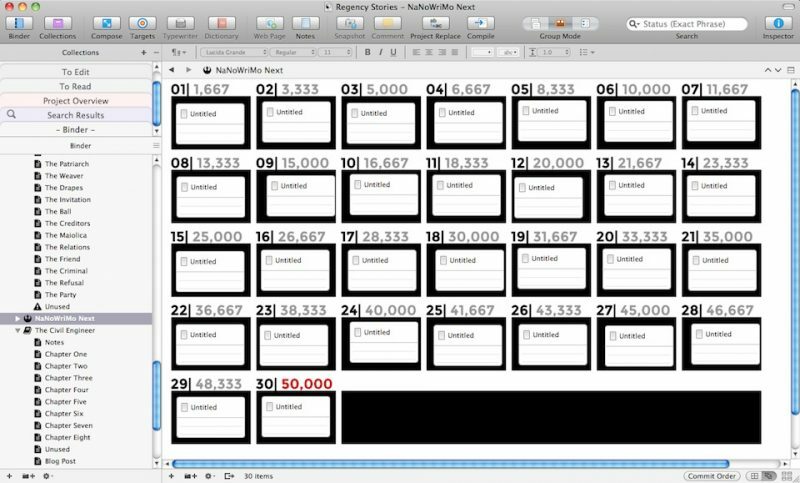 It only takes a few seconds to change the background, and the locations of all of the freeform index cards are saved, so you won’t have to rearrange them every time. Define “to do” and “done” options in the Status field and make the stamps visible in Corkboard view. Define “to do” and “done” in the Labels for a colour-coded overview. Define “to do” and “done” Keywords and show the colour chips in the Corkboard view. This isn’t really the best use of Keywords, but it’ll work! Choose icons to use for incomplete and complete tasks. For example, you might want to create a Collection for scrivenings you still need to edit. If you’re using the Status field to track this, you could perform a search for all Draft items that include “edit” in the Status. Then click the magnifying glass icon next to the search field and select “Save Search as Collection”.When you’re ready to organise/schedule, you’ll need to select the Collection in the Binder and go to View > Collections > Convert to Standard Collection to be able to set a freeform background. Like the icons I’m using? They’re from The One Page Novel Master Template (one of the full course bonuses). 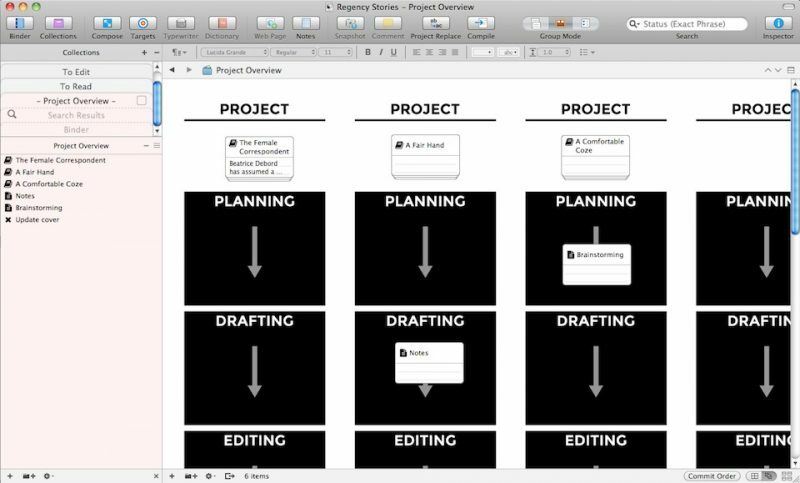 To use them in other projects, open up a project using the template, right click on an icon in the Binder and select “Manage Icons”. Now, select all of the icons in the top pane and drag them down to the bottom pane, so they’re available application-wide. You can download the month-to-view calendar for free! Just click the button below. Please try out the free sample before you purchase the full bundle, to make sure this technique works for you! Attention Lady Writers League members! You will find this bundle awaiting you in the Library. 2. Open up your Scrivener project, then go to Preferences > Corkboard (tab) > Freeform background > Custom background… Select one of the images you unzipped. 3. Click on any folder, then select Corkboard View using the icon in the toolbar or by going to View > Corkboard. 4. Now select the freeform style by clicking the icon at the bottom of the screen or by going to View > Corkboard Options > Freeform. Your background image should now show up. You might need to resize or close the Binder and/or Inspector panes to see the entire image. Now you can arrange the index cards to suit your workflow. Just be careful not to click “Commit Order” or you might end up rearranging your project! If you move cards towards the edges of the Corkboard, the view will expand. Because the background tiles, you can easily create another blank calendar (or other organisational background space) to use! A Word of Caution – While I haven’t had any problems with losing information, I want to urge you to be careful when you’re rearranging a project, that you don’t lose your Corkboard layout. If your index card layouts are vital to your project, your safest bet is to save the files as Collections, and to take a screenshot.